The client is a global multinational consumer electronics company, headquartered in Germany. It is the largest German business conglomerate and a market leader in the electronic consumer goods industry. One of the major challenges that businesses face when it comes to incorporating marketing analytics into their business processes is knowing how to get started. They often lack the analytics expertise required to collect data, analyze it, and extract insights that help drive profitability. On the other hand, it is no secret that businesses collect enormous amounts of data every day. It includes sales data, data obtained from marketing campaigns, and customer loyalty programs. The way customers interact with brands has undergone a major transformation over the past few years which the key reason behind retailers looking at developing an effective marketing ROI solution. To understand the impact of marketing spend and to effectively gauge marketing effectiveness it is essential to use customized marketing analytics services. With a keen eye on analyzing insights on their digital presence, the client- a global consumer electronics manufacturer collaborated with Quantzig to improve their marketing performance. As a part of this engagement, the client was looking at assessing their marketing campaigns, website performance, and social engagement by leveraging marketing analytics services. What would be the right analytics approach to use to gain extreme insights into your marketing campaigns? Our marketing analytics services can help you determine the right approach. Get in Touch with our marketing analytics experts! The client faced major challenges in capturing structured and unstructured data and integrating it with their marketing strategies. Though they possessed huge volumes of customer data the client faced difficulties in effectively aligning the data sets with the right business process for each phase of the customer journey. The third major challenge faced by them revolved around the difficulty in manually tracking marketing spend. This process not only turned out to be tedious but also created a huge lag between the client’s marketing efforts and evaluation. Make better marketing decisions with Quantzig’s marketing analytics services. We’ll help you ensure you improve your MROI. Request a FREE proposal. With the objective of helping the consumer goods company improvise their digital presence, a team of dedicated marketing analytics experts with in-depth knowledge on marketing mix optimization and advanced analytics was deployed to analyze their challenges. During the course of this marketing analytics services engagement, it was observed that the consumer electronics retailer spent a considerable portion of their marketing budget on print and display advertising to reach its target consumer base. However, a detailed analysis of the consumer decision journey highlighted the fact that the potential customers for electronic goods browsed the retailers’ websites—and fewer than 5% visited the manufacturer’s webpage. Shifting the client’s focus from general advertising to targeted marketing helped them witness a 60% improvement in online sales. The primary objective of this marketing analytics services engagement was to offer tailored marketing analytics services aimed at enhancing the clients’ digital presence. Our marketing analytics services focused on developing precise solutions that help quantify and categorize the contribution of each digital channel on sales, along with a deep dive analysis of marketing campaigns, and the simulation scenarios to aid the allocation of marketing spend. Want more insights on our marketing analytics services? The initial phase of this marketing analytics engagement revolved around benchmarking key marketing channels to identify the best platforms that suit the clients’ business objectives. The second phase revolved around the use of marketing analytics services to aid the development of a single digital dashboard with built-in plugins for integrating data from several sources such as- social media platforms, marketing campaigns, and customer touch points. By integrating data from several marketing channels and consolidating it into a common marketing view the client gained invaluable insights on driving their marketing efforts forward. By leveraging the use of customized dashboards and marketing analytic sservices the client achieved a whopping 60% reduction in the time spent on collating and analyzing data from disparate sources. The marketing analytics services offered by our experts also helped the client to leverage the use of marketing ROI (MROI) simulators to analyze the impact of their marketing decisions. This brought about positive results in just eight weeks of implementation. 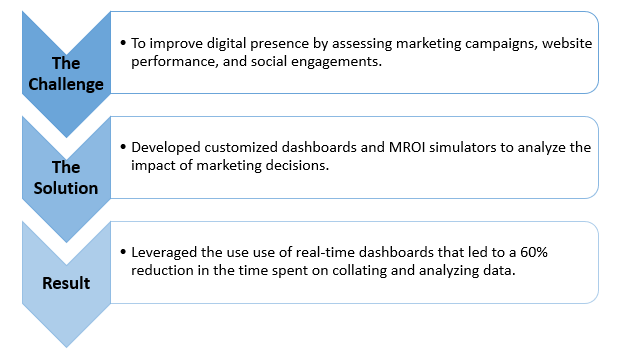 As a result, the client gained granular insights for comparative MROI analysis across marketing channels. With the help of our marketing analytics services, the client also identified several incremental revenue opportunities by running what-if scenarios. Marketing analytics services revolve around the processes involved in measuring, analyzing, and managing the marketing performance of businesses to optimize their marketing ROI (MROI) and enhance marketing effectiveness. By leveraging the power of customized marketing analytics services marketers can improve business efficiency and reduce the wastage of marketing spend. Companies that make improvements in their marketing mix and ROI capabilities are more likely to improve their marketing effectiveness and outweigh their competitors. With that being said, its essential that businesses should leave no stone unturned when it comes to investing in marketing analytics services. Stop wasting money and start tracking your marketing efforts! Schedule a FREE demo or fill out our online form to know more about our marketing analytics services.